The Global Volcanism Program has no activity reports for Ile de la Possession. The Global Volcanism Program has no Weekly Reports available for Ile de la Possession. The Global Volcanism Program has no Bulletin Reports available for Ile de la Possession. Ile de la Possession, located immediately W of Ile de l'Est in the Crozet archipelago, consists of a stratovolcano intruded by ring and cone dikes and modified by block faulting, marine erosion, and uplift. The structural center of the volcano is located on the W side of the 14 x 19 km island, which has an irregular shoreline. The stratovolcano was formed during at least five stages dating back to the Miocene. The eruption of plateau basalts from a rift system during stage IV was followed by a glacial period and then by the eruption of scoria cones and lava flows. The young scoria cones are of probable Holocene age and are distributed over much of the island, concentrated at the structural center on the W side and along a series of N-S and NE-trending fractures. The Mont Branca cone on the W flank has been estimated by Bellair (1964) to be not more than a few centuries old. Gunn B M, Abranson E C, Watkins N D, Nougier J, 1972. Petrology and geochemistry of Iles Crozet: a summary. In: Adie R J (ed) Antarctic Geol and Geophys, IUGS Ser-B(1): 825-829. The Global Volcanism Program is not aware of any Holocene eruptions from Ile de la Possession. If this volcano has had large eruptions (VEI >= 4) prior to 10,000 years ago, information might be found on the Ile de la Possession page in the LaMEVE (Large Magnitude Explosive Volcanic Eruptions) database, a part of the Volcano Global Risk Identification and Analysis Project (VOGRIPA). There is no Deformation History data available for Ile de la Possession. There is no Emissions History data available for Ile de la Possession. 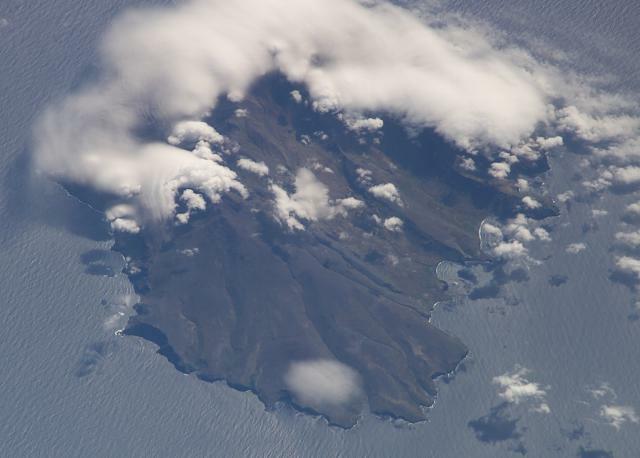 Ile de la Possession, located immediately west of Ile de l'Est in the Crozet archipelago, is seen in this NASA Space Shuttle image (with north to the top). The 14 x 19 km wide island is structurally complex and has an irregular shoreline. It consists of a stratovolcano intruded by ring and cone dikes and modified by block faulting, marine erosion, and uplift. Young scoria cones of probable Holocene age are distributed over much of the island. NASA Space Shuttle image ISS006-E-37990, 2003 (http://eol.jsc.nasa.gov/). The Global Volcanism Program has no maps available for Ile de la Possession. There are no samples for Ile de la Possession in the Smithsonian's NMNH Department of Mineral Sciences Rock and Ore collection. Large Eruptions of Ile de la Possession Information about large Quaternary eruptions (VEI >= 4) is cataloged in the Large Magnitude Explosive Volcanic Eruptions (LaMEVE) database of the Volcano Global Risk Identification and Analysis Project (VOGRIPA).